Almost four years back in 2015, Aston Martin promised its fans that it will be launching an electric car. And now, keeping its word, the company has finally revealed its first all-electric car called ‘Rapide E’. The newly-launched car was unveiled by Aston Martin today at the Shanghai Auto Show. The Aston Martin Rapide E is based on the auto-maker’s existing combustion engine Rapide sedan and the company has also said that only the 155 will be made available. The new electric car is powered by an 800-volt, 65kWh battery, which according to the company can make the vehicle run “over 200 miles” on a single charge. Aston Martin Rapide E has twin motors placed on its rear axle that will be able to generate 450kW (more than 600 horsepower). The motors can also get the new car to a speed of up to 155 miles per hour. Furthermore, Aston Martin has also said that the car will be able to go from 0 to 60 miles per hour in under four seconds. We should mention that this is faster than the standard internal combustion Rapide S. The company has also ensured that the car doesn’t take too long to be charged. 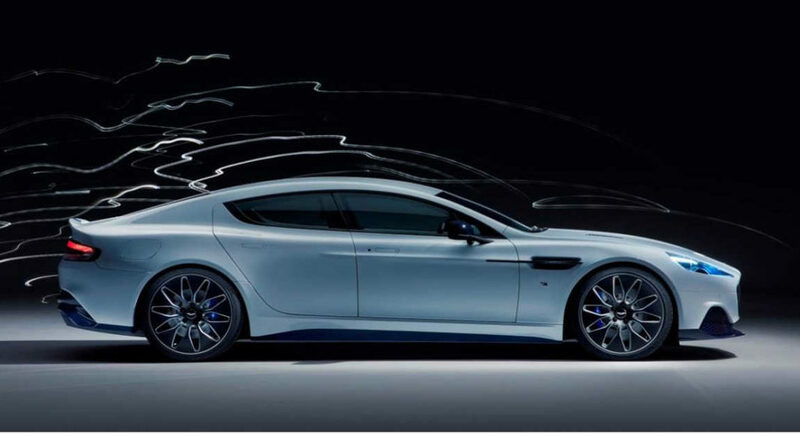 According to Aston Martin, Rapide E’s battery will be recharged at a rate of 31 miles per hour. Speaking of in-car tech, the Rapide E will sport a 10-inch digital instrument cluster, which will be placed behind its steering wheel. In addition to this, right above its dashboard, an 8-inch display will be placed that will handle all the infotainment related duties. The display will have support for Apple CarPlay as well as Android Auto. The body of the car looks a lot like the combustion engine car’s that it is based on. The difference is in the electric blue accents on the headlights of the car and the brake callipers. While the looks are similar, the internals are completely different. To begin with, the battery system of Rapide E has been placed where the V12 engine, gearbox, and fuel tank are placed in the combustion version. However, unlike electric cars from Tesla, Aston Martin’s Rapide E does not have a full floor of batteries. The company may have decided to do this to cut down on some costs, but we should add here that this obviously reduces the number of battery cells and capacity that have been used in the electric car. Another thing worth adding is that Rapide E weighs 4,717 pounds, which is around 400 pounds more than Rapide S.